Attached to this message (and linked here) is a document describing the project. Attached is a list of participants of the Host Range Project. Check to see that you are included if you indeed signed up! The MTA process was begun at Pitt on Friday, Sept. 9, 2016. MTAs are currently under review in Pitt's Office of Research. Once they have passed that process, they will be coming to you and your legal contact person for signatures. Please sign and return immediately! If all goes well, we can ship in early October. If you are participating in the Xeno project, your MTA includes materials for both projects. Also attached is the list of 30 (yes 30!) phages that will be sent you way in early October! I have updated the participant list today 9-29-16. At Lehigh we will be using the strains Mycobacterium austroafricanum and Microbacterium natoriense. 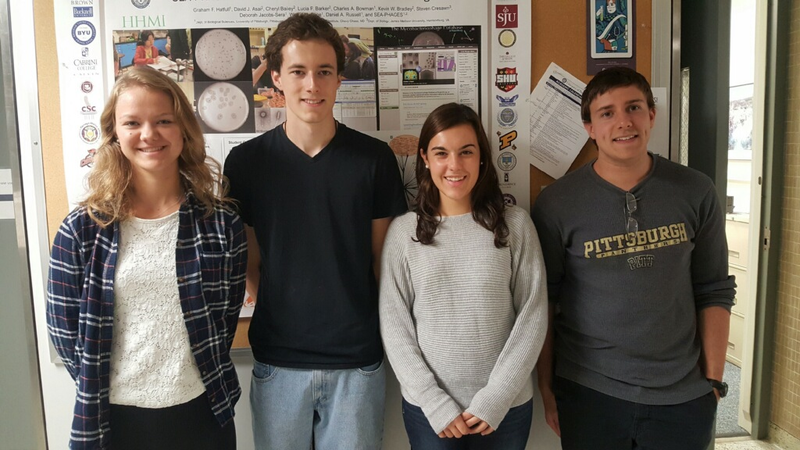 The Hatfull Lab Undergraduate researchers prepared the lysates for the Host Range project. The leaders of the group are pictured here: (from left to right) Audrey, Patrick, Gabby, and Johnathon. Here is the list of phages for the host range project and their titers. Note: Wintermute is a phage found by Bryan Pasqualucci at Southern Connecticut State University (incorrectly labeled in the sheet that was sent with the lysates). Sorry Bryan! Lee Hughes is visiting Lehigh from the University of North Texas and we are talking about phage, of course! We are wondering about findings from this project. Is there an anticipated date when we might learn about the results? You can post your results on this forum under the topic "Post Results Here". I also provided a format, so that the results reporting could be consistent. The same procedure is in place at the Xeno Challenge Forum for those results. I am curious to see if these mechanisms work, so by all means, post away! Thanks! What size plate is typically used for the host range project? We are having difficulty fitting all 8 dilutions plus a negative control in a row onto a 100mm X 15mm plate. Wondered if other people were just using bigger plates. I use big plates - 150 x 15mm. You can do fewer lysates/plate if you want to use the 100 x 15mm. Whatever you have available is great!